Ron Funchess is hysterical as usual and the guests are great! A must listen! I first saw Ron on Undateable, and then he was my favorite contestant on @midnight. His adorable laugh draw me to him, but he is a serious comedian, and Gettin Better is a great way to get to know more about him and his life. Contagious laugh! Watch Giggle Fit! This is the best. Ron is hilarious! I am a huge fan of Ronâs standup and I love getting to experience more of this side of him. His guest selection and interview style are perfect. The positivity he exudes has really helped me work on my own outlook. This podcast immediately became my favorite podcast and I never miss an episode. I started to first dig Ronâs whimsical way of inhabiting our world on @Midnight and Chelsea Lately and this podcast is a breath of fresh air. As I train to become a insight meditation instructor, I am concerned with and a supporter of anything that leads to more kindness and self-awareness. That doesnât mean the path to getting better has to be dry and humorless though! This is a funny podcast that avoids the comedian-led podcast pitfalls of cool cynicism or mean spiritedness while still being funny. Sure, thereâs a place for all stripes of comedy but this pod is a rare gem. As an old black nerd and fan of the Native Tongue family of bands, I think fans should be called Merriment Marauders as Ron suggested and consider me one of them. Check it out! Every episode I listen to helps me be a nicer, more pleasant person! Such a good podcast! We love you Ron! Listen to the theme song and try not to grin. Love starting my day with Ron because he puts you in a positive head space and honestly the intros are the best part. Itâs like calling your dad to check in but getting that unexpected lil pep talk that you actually really needed. Ron is so funny and so positive. This is a great podcast that we all need in these depressing times. How can anyone not like Ron? Bet he would be great to hang out with and get high. Infectious laugh and positive outlook. What more can you ask for in a podcast? Love listening, love your comedy and honestly your laugh could not make me happier. Thank you! So I have been a fan of Ron for awhile and this podcast just makes me so happy! I love that it isnât just another comedy podcast and that it is so inspirational. This is a podcast that makes me laugh, smile, and want to keep getting better! Ron is doing a great job with this podcast and gettinâ better. Super upbeat, positive, and funny. Every episode puts a smile on my face. Love it. Perfect mix of comedy and uplighting conversation. So great!! Keep it up Ron, this is terrific and I listen to it when I feel like Iâm slipping into a funk and it brightens me up. Started listening because I love his comedy. Stayed because he makes me want to be a better person and is way more approachable about it then any other self help/ motivational podcast out there for me (his comedy shines too). Love this, thanks man. Ron brings the positivity we all need in our lives. If youâre looking to make your life better, this is the podcast you need. Need more comedians that use positivity to make people laugh. Great podcast!!!! Ron Funches fuses realness, comedy, positivity, and hard work together for an amazing podcast. He is not positive in a hollow, corny way. His guests are great and after I listen I will have laughed and learned something to improve myself. Itâs like snuggling a fuzzy purring kitten. I leave my time with Ron with a smile on my face. Heâs the kind of person you would love, and feel privileged to call, a friend. We need more bunches of Funches in the world!!! I have loved Ronâs work for a while now. I look for everything he is in. This podcast is my favorite form of Ronâs work. It is his honest, truthful and hilarious self. I have loved many of his guest and topics he brings up. As a wrestling fan, i love that he balances all his interest to not ostracize his audience but stays true to himself. I look forward to the variety of guest he brings into his home and on his show. Any âcelebrityâ would be crazy not to want to talk with the most positive man in Hollywood! Keep it up Ron! Great relatable, hilarious, random, inspiring Podcast! I have been a fan of Ronâs for many years, but I somehow missed out on the start of this podcast. I have since listened to about 15 episodes and I love it! Itâs a good time and he makes it feel like you could easily be a part of the conversation with him and his guest. I suggest to give it a listen, preferably from the beginning. I legit listen to every single episode the second I get word it becomes available. Such an inspiration and best of all he talks about wrestling!! 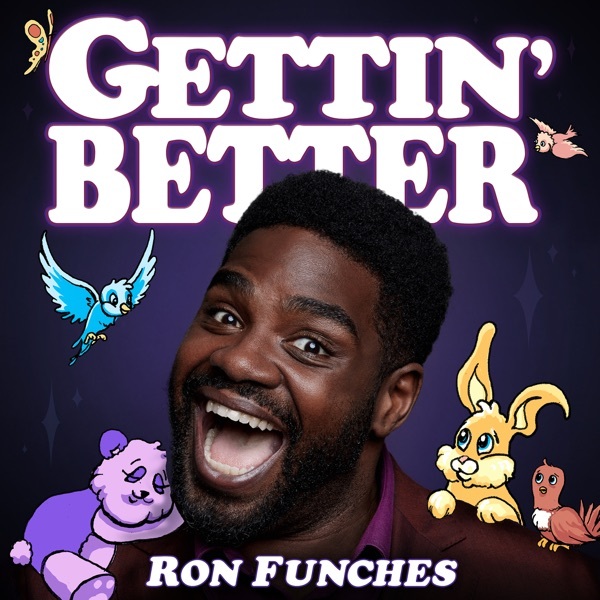 I looked up Ron Funches to see if he was on any podcasts (because I had seen & liked his comedy) and was pleasantly surprised to find this! Itâs not a comedy podcast as I would expect, but itâs even better. Itâs exactly what I needed. He exudes positivity and I love that, itâs so refreshing and puts a smile on my face. Ron is more than a comedian, heâs a multitalented guy that canât be put into a box, but most of all he comes off as a genuinely good person with a positive outlook on life who wants to help others. He is also an absolute joy to listen to. Ron is hilarious in every aspect, and he always has great guests on, definitely one of the top podcasts right now. So funny and positive! Anything goes! And wrestling! If you like being happy and laughing. Then this podcast is for you. Enjoy! I wanted to like this but literally half of this craptastic podcast is diet/exercise talk, covert body shaming and attaching morality to foods and food behaviors. I mean the guy asks for weight loss photos. Photos mean nothing, I dieted off 50 lbs but RUINED my heart and bone health permanently at age 27 because of the dieting, NOT being fat. This podcast is triggering, and promotes unhealthy speedy weight loss, and competition. Disappointed and wonât be tuning in. Wake up and smell the colonialism and capitalism keeping you thinking you need to be in a constant battle with your body. I wholeheartedly enjoy listening to Ron talk with anyone. His ability to draw relatable and interesting stories from his guests is incredible. I enjoy the range of guests booked as well. Yeah I start my day with this podcast, wanna fight about it?! I am an intermediate podcast listener and now this is in my life. We sometimes don't deserve nice things and in today's world, I can rely on Ron. This man has a growth mindset of level 99 if he was ever in a comedy video game and he was a character. (This is not a pitch, unless you want it to be, Ron. Let's talk.). I am also a comic in Oregon (Portland, OR) and people referred me as a low-valued Ron Funches and you know what? I'm gonna take it because Ron talks about opportunities and following your dreams. Ron if you're reading this, I didn't get to introduce myself at the Undertow Festival but hey dude, hope you come back to Portland soon. Keep it up! Ron Funches is an extremely likable, relatable, and motivational person and this podcast is a first rate showcase of those qualities. Further, this podcast not only aims to highlight the importance of striving to become a better person but also explores the realities of doing so in a way that is enjoyable to listen to. Itâs just like talking to a friend about getting through real life struggles and triumphs, not too aggressive not too lackadaisical. At any rate, listening truly has helped me to desire to grow and put getting better into action without falling into the toxic mindset of being too hard on myself. The more I tune in, the more I love the show - I would recommend this to anyone! Itâs a good time. To find this podcast was a real treat and hope from the bottom of my heart it does not ever have to come to an end!! This podcast is one of my favorites of all time! If you need some Ron Funches positivity, this is the place to be! Always had a hard time getting into podcasts but mere seconds into this and hearing Ronâs laugh and upbeat attitude sold me on this. Each episode so far has helped me think about ways to better myself as well as lifted my spirits when the world gets to be a bit overbearing. Truly an inspirational podcast hosting by an absolute bundle of joy. Please keep these coming! Every time I see Ron do stand up, or in a show, he makes me happy. And this podcast is so amazingly enjoyable. Why are you even reading this? Who cares what I think, go listen for yourself! Wonderful podcast! I love Ron Funches!!! Iâve been a fan of him for years but this podcast makes me love him even more. This was the perfect thing for me to listen to, so thankful I found it!! I like Ronâs laugh and his emotional availability. I mean Iâm not a huge fan of weed, wrestling or gaming, but I still want to hang out with this dude. His lilting speech patterns are so lyrical and they will soothe your ear soul. Those are some good words. So far this is a great show. I look forward to many new episodes! Found this last night! I love the premise of the show! Super pumped to listen to this. Been a fan since undateable! !